These mainly alpine plants are grown for their cushion or mat of closely packed white and pink flowers. 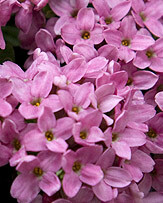 They are compact and showy so are perfect to add interest to the alpine garden and the rock garden. Most are suitable for pots and containers and will do well in an alpine house. 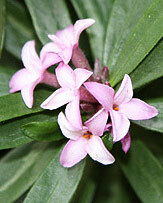 Androsace can endure cold and enjoy the sun but dislike being wet in winter. Plant in the full sun in a well-drained, gritty soil. Androsace species such as A. villosa, septentrionalis and occidentalis are an Alpine Plant. Other species include : A. lanuginosa (see picture of foliage right) the early flowering A. Carnea the pretty pink flowering A. sempervivoides are all well suited for growing in rock garden situations. There is over a hundred species of Androsace. Andosace septentrionalis (Stardust) The flattish rosettes hold multiple white flowers on long thin stems. 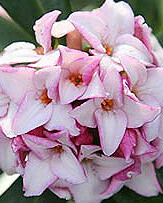 Grow these in a sunny or semi shaded part of the garden in well-drained soil. Androsace lanuginosa A hardy plant with flowers that are small and pink and have a darker centre. Flowers are present from early June to the end of July. Tolerates some sun but does not enjoy being too wet in winter. The early growth of the intertwining, trailing stems has a reddish tinge. This is a beautiful plant to trail over walls or rockeries. 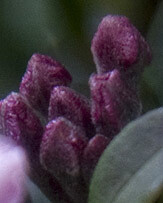 Small pointed green/grey leaves are densely covered in silvery hairs. Propagate by layering or from cuttings in summer. Androsace bulleyana grows quite easily from seed and flowers usually 2 years after it is sown. Needs protection from winter rains. This plant has striking red flowers on a long, erect stem rising from a flat rosette of green leaves. Androsace carnea (Pink rock jasmine) Pink-pink/purple flowers in late spring and early summer. 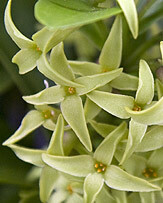 A perennial, evergreen, clump-forming plant that can be grown in full sun or partial shade. Do not overwater. Is also suitable for pots and containers. Propagate from seed. 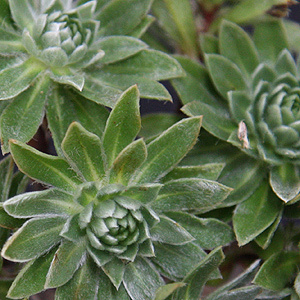 Androsace hausmanii: a small, quite short-lived plant with white to pale pink flowers growing on very short stems on small domes of green grey leaves. Flower from June to August. Propagate from seed.